Director – Federico D’Alessandro, Screenplay – Noga Landau, Producers – Russell Ackerman, David S. Goyer, John Schoenfelder & Kevin Turen, Photography – Larry Smith, Music – Bear McCreary, Visual Effects Supervisor – Raymond Gieringer, Visual Effects – Chimney VFX, CoSA VFX (Supervisor – Tom Mahoney), Crater Studios (Supervisor – Petar Jovovic), Garagevfx (Supervisor – Tomas Roca) & Mr. X, Inc., Special Effects Supervisor – Muhammed M’Barek Toske, Production Design – Miljen “Kreka” Kljakovic. Production Company – Phantom Four/Addictive Pictures. Julia, who survives as a petty thief, is knocked out by an intruder in her apartment. She wakes up locked in a basement with several others, finding they have been given mouth guards and neural implants in the back of their neck. She manages to improvise an ingenious breakout from their cell but the others are killed by the security robot in the house above. The home’s owner, billionaire tech genius Alex Upton, returns and makes Julia his prisoner. Alex is attempting to complete an artificial intelligence but needs to model the emotional states of human subjects to make it work. He announces that he is going to keep Julia a prisoner until the project is finished. Julia is able to bargain with him to obtain clothing, food and a degree of freedom within the house, although everything is guarded by the security A.I, Tau and its robot handlers. Julia soon realises that her hopes for making an escape come in bargaining with Tau who is hungry for input and knowledge about the outside world. Tau was a directorial debut for Federico D’Alessandro who has a number of high-profile credits as a storyboard artist, including work on several MCU films, Terminator Genisys (2015) and The Mummy (2017). The film is co-produced by David S. Goyer, the high-profile screenwriter of films such as Blade (1998), Dark City (1998) and Batman Begins (2005), among others. Tau premiered on Netflix. 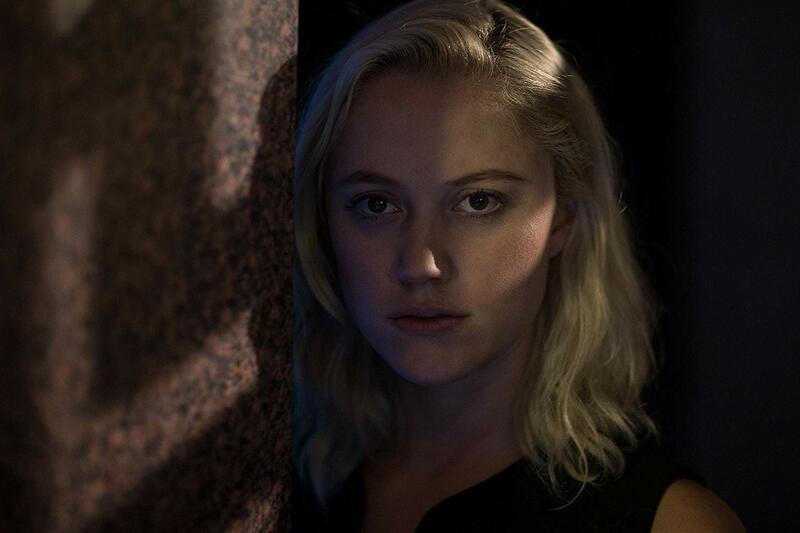 The film comes with an intriguing premise – a girl (Maika Monroe) is imprisoned in the house of a mad tech genius where her only hope for escape comes in befriending the genius’s home A.I, and appealing to its curiosity for more input whereupon she develops a relationship of sorts with it as she teaches it new concepts. The set-up reminds somewhat of Demon Seed (1977) where the heroine was imprisoned inside a house by a mad computer that wanted to impregnate her, or Hardware (1990) where the heroine was pursued around her apartment by a lethal killer robot. Of course, here the machine is benevolent and she is not seeking to escape the A.I. so much as from the mad tech genius who wants to dissect her brain where she needs to find ways to countermand the A.I.’s controls of the home security system and evade its robot handlers in order to escape. The main problem with the film is that it has a badly informed idea of how a credible A.I, would act and behave. Being like a child eager for more music and understanding about the world is probably not one of them. Being able to develop a sense of relative ethics where its eagerness for input could override its core programming, or it can learn to withhold information and tells untruths would probably be another. Perhaps the silliest parts about the film are the scenes where the A.I.’s creator Ed Skrein ‘punishes’ it by deleting its memories. (Maybe that’s what I should do next time my computer crashes – delete a few files – that’ll teach it!). In the end, the film becomes a sentimental one where Maika Monroe teaches the A.I. ideas about good and it learns that killing is bad and so on. The whole laboratory goes up because Ed Skrein is one of those scientists who has decided it is a sensible idea to build a self-destruct switch with no safety overrides but Maika makes an escape and finds that the A.I. has survived because it has somehow managed to transfer the entire memory core into a tiny drone about the size of a webcam. Federico D’Alessandro does a worthwhile job directing. Particularly good is the futuristic production design for the house, which includes items like walls made of glass that can be made opaque at the touch of a button. It is a film where an intriguing set-up carries it much of the way over an ill-informed treatment of its SF element. For a lot of people that was the end of it and they dismissed Tau. By the same token, both the Star Wars and Terminator films have androids and A.I.’s behaving in ways that are not logical or realistic so I am inclined to cut Tau a little more slack than that.